Worksheet on analyzing graph is much useful to the students who would like to practice problems on solving real-world problems using graphs. Many real-world situations can be represented by linear relationships. We can use graphs of linear relationships to visualize situations and solve problems. Recall that y = mx + b is the slope-intercept form of the equation of a line. In this form, it is easy to see the slope "m" and the y-intercept "b". So we can use this form to quickly graph a line by plotting the point (0, b) and using the slope to find a second point. 1. Ken has a weekly goal of burning 2400 calories by taking brisk walks. 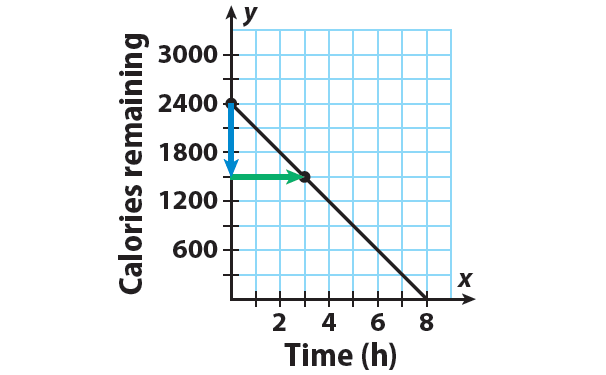 The equation y = -300x + 2400 represents the number of calories y Ken has left to burn after x hours of walking which burns 300 calories per hour.After how many hours of walking will Ken have 600 calories left to burn ? After how many hours will he reach his weekly goal ? 2. Jose wants to buy a new game system that costs $200. 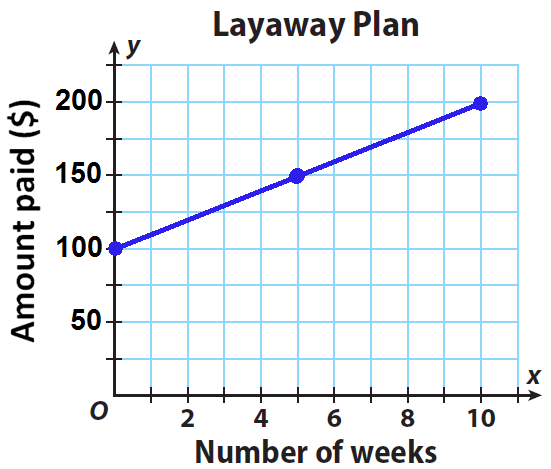 He does not have enough money to buy it today, so he compares layaway plans at different stores. Store A requires an initial payment of $60 and weekly payments of $20 until the balance is paid in full. The plan at Store B is shown on the graph. Ken has a weekly goal of burning 2400 calories by taking brisk walks. 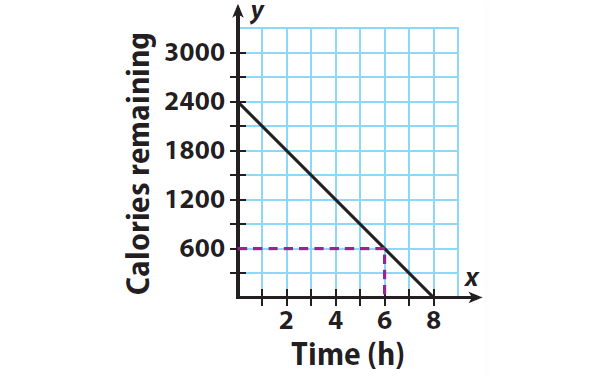 The equation y = -300x + 2400 represents the number of calories y Ken has left to burn after x hours of walking which burns 300 calories per hour.After how many hours of walking will Ken have 600 calories left to burn ? After how many hours will he reach his weekly goal ? The y-intercept is b = 2400. Plot the point that contains the y-intercept : (0, 2400). Write the slope as a fraction. Using the slope as -900/3 helps in drawing a more accurate graph. The slope is m = -900/3. Use the slope to find second a point. Since the slope = rise / run, from (0, 2400), count down 900 units and right 3 units. Then, the new point is (3, 1500). Draw a line through the points. Locate 600 calories on the y-axis. Read across and down to the x-axis. From the graph, we can know that Ken will have 600 calories left to burn after 6 hours. Ken will reach his weekly goal when the number of calories left to burn is 0. Because every point on the x-axis has a y-value of 0, find the point where the line crosses the x-axis. Ken will reach his goal after 8 hours of brisk walking. Hence, store A allows Jose to pay for the game system faster. After having gone through the stuff given above, we hope that the students would have understood, "Analyzing graph worksheet". Apart from the stuff given on "Analyzing graph worksheet", if you need any other stuff in math, please use our google custom search here.